Saphira Eco is our comprehensive line of eco-friendly consumables for prepress, press and Postpress. Products carrying the Saphira Eco label meet or even exceed environmental standards while ensuring top production results. Using Saphira Eco consumables will enable you to meet the requirements of international or regional environmental certification programs such as Nordic Swan, the EU's EcoLabel or the Austrian Environmental Certificate Criteria for print products. 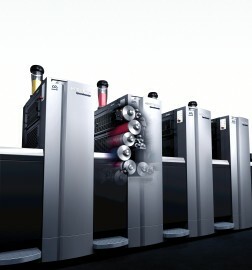 Heidelberg has imposed strict rules upon itself for the selection, procurement, and marketing of Saphira Eco consumables. Proof that we keep to these rules and that our management system corresponds to the demands of the ISO 9001/14001 standard can be found in our certificate. 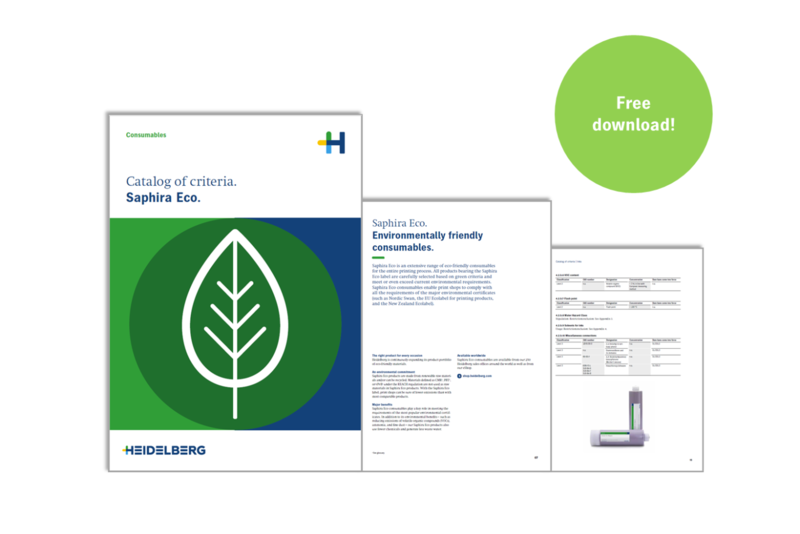 Download the Saphira Eco Criteria Catalog. Our catalog of criteria contains a concise, factual representation of all Saphira Eco product groups. It highlights their relevant components and explains which criteria have led to Saphira Eco consumables being classified as suitable for green printing.